HF: See added extract from a report at the end of this article regarding suggested reason for the final demise of the salt industry in Tai O which had probably been in existence (at least in HK) from about the 3rd century BC. 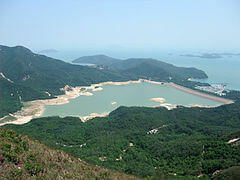 2013 marked the 50th anniversary of the opening of Shek Pik Reservoir on Lantau island. It was built between 1957 and 1963 and has a storage capacity of 24 million cubic metres making it the third largest reservoir in Hong Kong today. The dam was built across Shek Pik Heung valley and the reservoir submerged four villages, Shek Pik Tai Tseun (石壁大村), Fan Pui Tsuen (墳背村), Kong Pui Tsuen (崗貝村) and Hang Tsai Tseun (坑仔村). Construction of the reservoir also saw that of the South Lantau Road which runs across the top of the dam and brought vehicular access to Tai O for first time. The salt trade in Tai O.. After the Second World War, the competition from foreign imported salt became overwhelming after about 1955, and the salt-field operators closed business between 1955 and the mid 1960s, although a few of the salines continued to be worked by the old salt-workers as squatters, until 1969-1970, [ earlier?] when the construction of the Tai O Road destroyed the sluice systems. This article was first posted on 10th June 2014.